Visa-exempt foreign nationals : European Union citizens (except Estonia, France, Portugal, Slovakia and Spain*), Albania, Andorra, Antigua and Barbuda, Australia, Bangladesh, Barbados, Belarus, Belize, Benin, Bhutan, Bolivia, Bosnia and Herzegovina, Botswana, Brunei, Burkina Faso, Cambodia, Canada, Cape Verde, Cote d'Ivoire, Cuba, Dominica, Ecuador, Fiji, Ghana, Grenada, Guinea, Guinea-Bissau, Guyana, Honduras, Iceland, Kiribati, Kosovo, Liberia, Laos, Lesotho, Liechtenstein, Macao, Macedonia, Malawi, Malaysia, Maldives, Mali, Malta, Mauritania, Micronesia, Monaco, Montenegro, Morocco, Nauru, Nepal, New Zealand, Niger, Nigeria, North Korea, Norway, Palau, Papua New Guinea, Russia, (56 days), Samoa, Saint Kitts and Nevis, Saint Lucia, Saint Vincent and the Grenadines, San Marino, Senegal, Serbia, Sierra Leone, Singapore, Solomon Islands, Suriname, Swaziland, Switzerland, Republic of China, Togo, Tonga, Trinidad and Tobago, Turkmenistan, Tuvalu, United Arab Emirates, Vanuatu, Vatican City, Venezuela, Zambia. * only for Spanish travelers on a direct flight to The Gambia. Nationalities only subject to entry clearance : Bahamas, Dominican Republic, Haiti, Indonesia, Jamaica, Kenya, Mauritius, Namibia, Philippines, Seychelles, South Korea, Sri Lanka, Tanzania, Timor-Leste, Turkey, Uganda, Zimbabwe. Nationalities who can obtain a visa on arrival : France, Portugal, Spain*, United States. * Spanish travelers on a direct flight to The Gambia are visa exempted. Nationalities subject to visa : citizens of all other nationalities must obtain a visa in embassies before arriving in The Gambia. 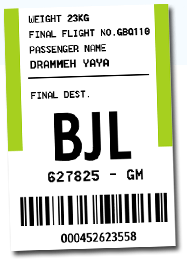 Warning: a passenger with no Gambian identity papers (passport or identity card) is a foreign passenger and as such must have a visa. How to obtain a visa ? The Gambia allows entry into its territory to foreign travelers having a passport (except for Belgian citizen who only needs their ID card) and, for those who are not exempt from, a visa. This visa can be obtained from the competent diplomatic representation of the place of residence of the traveler. Each traveler on arrival is also subject to a biometric check from an immigration officer. Standard procedure in embassies: you can go to the nearest gambian embassy with the required documents they asked you to bring. For information, consular information about Switzerland, France, Benelux, Germany, Slovakia, Poland and the Czech Republic.